Generally in the summer, I hit a savings slump. I tend to get distracted from savings. There is a simple way to organize yourself and save more money, is to make a list. 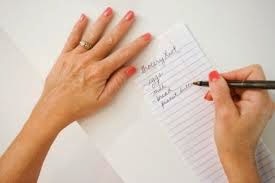 I see shoppers all the time in the store with their hand written needs. There are ways to make the list easier to create weekly. Make your list on a set day each week while reviewing the coupon match blog, or looking at the weekly ad. You can also take inventory of stockpile and then decide what should be on the list. If you have a roast, 1 lb of Hamburger and some noodles, you can put those in programs on the net to see what recipes match what you already have. Then that will help you to use up items in the pantry. It may be the middle of summer, and an easy time to get off track. try one of these methods to keep your annual savings goals in sight.